The vast majority of the developments over the years have been driven by a need, a need to get online faster, a need to push more data, a need for cheaper bandwidth and now a need to operate within a moving vehicle. 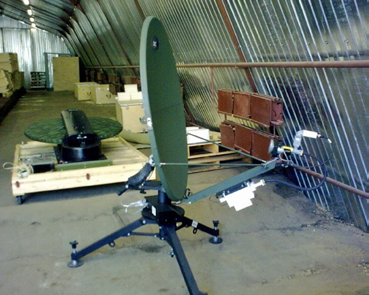 In the early years, the only option for satellite communication was large fixed antennas using C-band carriers. While this worked well, the size of the antennas made for difficult use in a ‘field’ environment. Power levels on C-band satellites were quite low, which required transmitters (BUCs) to be quite large. In turn, the higher power output meant the power supply needed to produce more power and, in a portable environment, a larger generator was required. Trying to use the large C-band reflectors in a mobile application was a challenge, as the reflector size was, in some cases, larger than the vehicle itself. That necessity created the advent of foldable wings, whereby the edge of the antenna would fold in to allow the reflector to fit within the width of the supporting vehicle. These systems were motorized in some cases, but needed to be pointed by hand by an operator. This solution worked well but still required a large vehicle, a large power supply and a technically trained person for operation. Once the world tasted communication from the field, a more portable solution was requested. The necessity for more bandwidth on one satellite produced the advent of the Ku-band, which offered users several benefits. 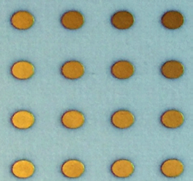 Ku-band meant smaller reflectors were needed to provide the same, or better, bandwidth. Additionally, less power was required on the transmitter and that translated into less power being needed from the generator. Smaller reflectors also provided for an easier alignment as the beam width was much larger and, therefore, the ability to locate the satellite manually became much easier. This development would change the landscape of the field environment and large C-band systems were slowly replaced with smaller Ku-band solutions. Due to the larger capacity on the Ku-band transponders, the availability of Ku-band bandwidth was greater than the ‘always in short supply’ C-band. A typical C-Band transponder offered in the range of 24MB of bandwidth, whereas a Ku-band transponder offered 54MB. As new satellites were deployed and older units replaced, the amount of Ku-band bandwidth became greater and was available far more readily. The question of security was also addressed in the then, new, Ku-band environment. As new Ku-band modems hit the market, security was bolstered with the inclusion of DES Encryption as a standard for the data which was being transmitted up to, and down from, the satellite. In some modems, that security could be augmented to include FIPS level of encryption. This provided a secure method of communications and a level of confidence that was welcomed by all users. 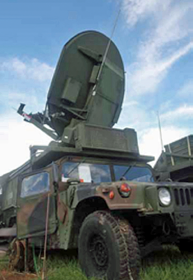 The requirement to ‘hand point’ antennas when needed was still an issue and so, again, the necessity to automate that process created the solution in the form of ‘Auto-Deploy’ units. These systems were equipped with an Automatic Controller Unit (ACU) and a set of motors and sensors which could point the reflector in the correct alignment. This allowed a transmit and receive signal to be passed with almost no effort required by the operator. This invention eliminated the need to use trained individuals to construct, align and operate the system in the field. Now, a minimally trained person could simply open a box, press a button and start to communicate. 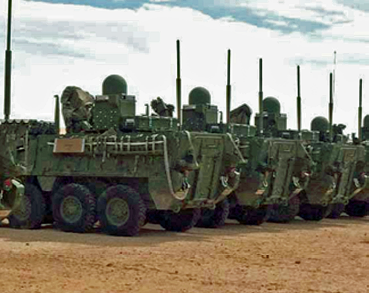 These Auto-Deploy systems were a blessing to those users who needed mobility, ease of operation and quick deployment. However, the portability of the units continued to need improvement. A request was issued for a smaller, lighter version of the Auto-Deploy system that would make carry and setup far easier. Once again, this necessity was answered with the Fly-Away system. The Fly-Away solution uses an Auto-Deploy system mounted on a tripod, easily carried, with setup accomplished in just a few minutes with no tools. With a single press of a button, within a couple of minutes the operator is connected to the satellite. As these systems were operated in the Ku- or X-band segment, the transmitters were quite small and the reflectors reasonably sized. The Flyaway systems seem to be the perfect solution to the issue of portability and performance. At the same time, human nature is rarely satisfied with current technologies. 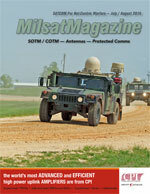 This resulted in the request for an even more portable solution that could delivery true battlefield portability. The concept of the ‘ManPack’ was born: a complete unit that would fit in a backpack, to be carried and setup by one person. In keeping with that request, a manual point, carbon fiber solution was developed. Unfortunately, the manually pointed system required a trained operator to use and setup the antenna. The portability issue was addressed, but at the expense of the automation. To some users, this was a good trade-off. To others, this was seen as a step backwards. To quell those who objected to the loss of automation, a new Auto-Deploy system was offered. This antenna required a second backpack or case to hold all of the extra equipment and the weight of the automated solution. Other than perhaps being able to shrink the size of the bits and pieces, this seemed like the perfect solution. What’s important to mention is that all of these systems required the user to STOP—the antennas could not connect to satellite while the user was in motion. 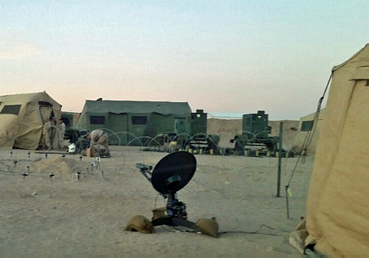 Comms-On-The-Halt (COTH) or Comms-On-The-Pause (COTP) remained the only solutions available, as the technology had not been yet harnessed to work with systems in motion. In today’s battlefields, vehicles must travel into unfriendly areas where constant communication is a requirement for safety. The action of stopping and deploying an antenna to connect to friendly operatives was now a much more dangerous option. Any stoppage creates a potential hazard to those within the vehicle. The request then arrived for a system that could be used while the vehicle was moving. This request necessitated a complete change in the thinking about the physics required to build auto-deploy antenna systems. A large, moving reflector would become nothing more than a target and likely would have a short life span in the field. The call went out for some new thinking that would produce a workable solution to this crucial mobility issue. 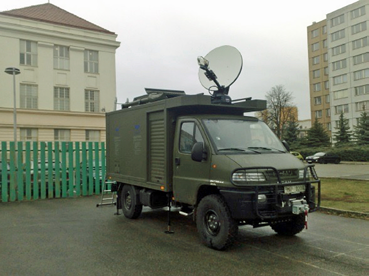 The initial attempt at providing a SATCOM-On-The-Move (SOTM) solutions involved taking a standard reflective antenna and mounting that antenna on a gimbal and then allowing the reflector to stay aligned to the satellite as the vehicle moved. This solution works well—the only drawback tended to be the size of the radome (think multiple feet tall and multiple feet in diameter) that was used to house the system. These types of antennas are used mainly in the marine environment where overall size is not the main concern. They were tried on aircraft, but their large size was not conducive to the aircraft market and other solutions were developed. A small, gimbaled solution was developed based on the need for a system to fit into the close quarters of the aircraft and one that could handle the vibration and speed of turns. These systems work extremely well but, due to their demanding engineering requirements, they have a tendency to be quite expensive. Given the high cost, these solutions have been relegated to the aircraft world and they have not broken into the land-based vehicle market. The necessity to have a SOTM solution for land use remained unresolved. To address SOTM needs, engineers began the design of a smaller solution that used a wave accumulation system in an effort to produce a flatter, thinner antenna that was efficient in spite of the physical size. While the system was shown to have worked relativity well, it needed to use Spread Spectrum bandwidth (think fairly expensive) as its ability to remain pointed accurately was less than desirable. In the military arena, using Spread Spectrum was not such a big problem but, in the commercial world, such was detrimental and limiting. The requirement of a simple, standard bandwidth, tough, reliable and reasonably priced SOTM product still remained unfulfilled. 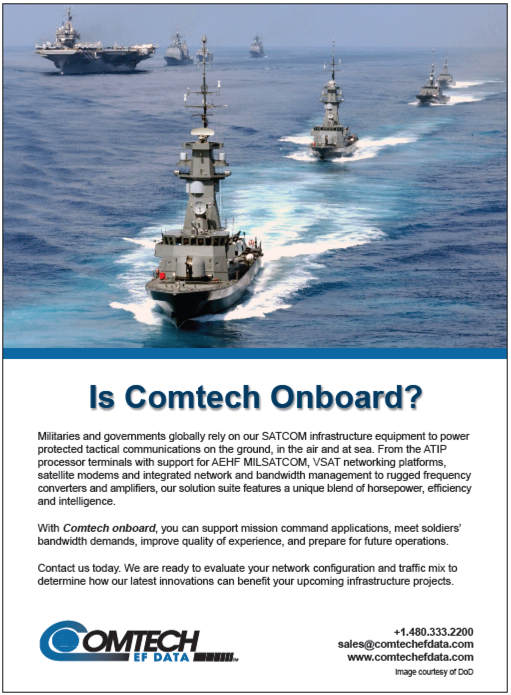 In an effort to address this need, the C-COM engineering team focused on developing new systems that would tackle these requirements and offer a solution that was also highly affordable. With the ubiquity of Ka-band, which is bringing to the user a lower priced bandwidth offering, the company selected to build a SOTM antenna around that technology. These efforts are starting to bear fruit and the company will demonstrate their first Ka-band SOTM product in Amsterdam during the upcoming IBC2016 trade show. C-COM’s long term efforts are being directed at the development of a Phased Array antenna system that uses new science developed in conjunction with a leading university. These efforts have produced and range tested the first 4x4 sub-array of engineered material, which will become the building block for a new generation of products. If Necessity truly is the Mother of Invention, then we should call on all necessities to continue their advance. Paul has worked with C-COM Satellite System Inc. since January 2007, for the past 4 years, acted as Senior Technical Advisor, prior to that he was Senior Application Specialist. 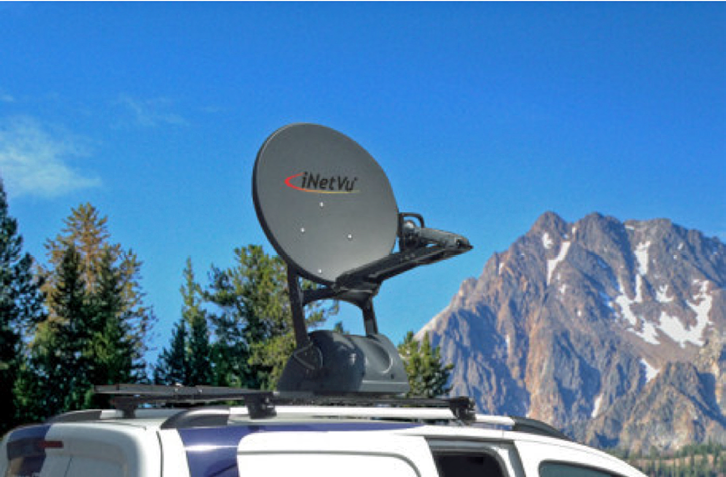 Paul’s current position requires him to travel the world assisting C-COM Resellers in providing their clients with the best possible solutions available for data, voice, radio and video applications over the iNetVu line of products.